Before going to this Hotel me my partner and our 12 year old girl were put in a slight sense of panic due to some of the negative reviews we read, what a load of nonsense. This Hotel is up there with the best for value for money, granted, it is a bit tired and in need of a lick of paint but you can't fault the cleaning team who are at it daily from top to bottom. The rooms are quite basic and a bit of a squeeze but how much time do you actually spend in your room. Speaking to some people, every now and again they did get a slight smell of sewage in the room but for us on floor 12, not a hint of it. With regards to the lift complaints, you have to appreciate that this hotel when full has 800 guests, who are all on the move at similar times of the day, so why would you not expect a slight delay. Do you get annoyed at people saving sunbeds at silly times of the morning, only to leave them until midday, well not here, the pool area opens at 9 and is patrolled by the lifeguard, who will move towels that are on saved sunbeds (works great). With regards to the pool area, it is raised to a level were you need to go up 30 steps, so not for you if you are not mobile. Round the pool, the food is there all day and very very fresh (check out the poolside barbecue every other day, outstanding). All in all, this Hotel comes highly recommended and is situated in a class 10 location. Don't let any negative reviews put you off, compared to the Hotel we paid a lot of money to stay in last year in the Dominican, then this WINS hands down, a fantastic holiday had by all in a very, very friendly environment. This was our second visit to this Hotel. Whilst our rooms was on the 7th floor the lifts did not cause a problem though they are in need of upgrading we often rode to the 8th floor and walked down if the lifts where busy. For all inclusive, the food was very good OK I have had better but for a family holiday in Benidorm it was very good. Breakfast was full English with several different cold meats and fresh breads, Lunch and dinner where very good with lots of choice both hot and cold. What I liked was sugar free sweets and also fresh fruit also at meal times. You got free water plus beer wine. The pool area was a bit manic but our grandson aged 12 thought it was fantastic. We used the outside bar where the service was very good with little queuing and if you wanted you could upgrade your drink pass for an extra 2 each day for branded drinks. Just returned after 2 weeks. Would just like to say the lifts in this hotel are terrible, 4 small lifts for 18 floors that kept breaking down. Had to walk down stairs good job I was only on 7th floor. Also having steps to go up for pool. Won't be going there again. Entertainment nil and the food was ok but had a lot better. We stayed at this hotel the last week in July and first in August for 14 nights on an all inclusive basis. The hotel is in a fantastic position literally two minutes from Levante beach, with all shops, bars, restaurants on your doorstep. 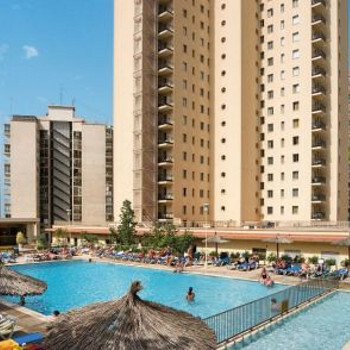 You are also two minutes away from the bus and taxi links to get you to all the major parks and attractions that Benidorm has to offer. The hotel itself is very much classic rather than ultra modern but is very clean and comfortable. The food and drinks are of a very high standard with plenty of variety and are of an excellent quality. The entertainment team are always on the go and work very hard indeed. Entertainment was of the usual AI standard but with so much around you we only actually stayed there for two or three nights as we liked to be out and about in the resort. All in all I would highly recommend the Los Dalmatas and would certainly return there. The price you pay is very reasonable indeed and offers excellent value for money. Having just returned from a 10 day holiday at the Dalmatas, we went with lots of reservations after reading previous reports, I would agree that it is not a 4 star hotel, much like a 3 star, but having said that, couldn't fault the hotel. The food was ok, sometimes a bit repetitive and probably not as much choice as we have had on previous all inclusive holidays, but usually found something to please all. The hotel is spotless, and the rooms cleaned and towels changed every day. Fantastic location, just near the beach (and MacDonald,Burger King and Subway). The entertainment on an evening was located inside and we always sat outside therefore couldn't comment too much on that. The all inclusive starts at 10.00 am until midnight with drinks, crisps, peanuts, ice-creams and ice-pops available, great when you've got a group of kids with you. The lifts seemed to be a problem, had a to wait quite a while sometimes. Great Hotel Los Dalmatas, 1 small niggle though! My husband and I have stayed at the Los Dalmatas for many years on half board which we found suited out budget. This hotel has a few issues which we didn’t find that difficult to deal with, it never stopped us going back, BUT April 2011 we were there for a holiday, it was on offer when we booked it ALL INCLUSIVE. We hated it. I think it has spoiled the hotel. The food then became repetitive, more or less the same for lunch and dinner so we avoided the lunches. The whole All Inclusive set up was wrong, wasn’t presented right. Now perhaps two years later they have got it right, but we have not been back, my husband loves the place. The guy who organises the dining hall is fantastic along with the rest of the staff. Pity they went All inclusive, it spoiled a lovely hotel. As i only stayed here for a short break of 4 nights i'll keep the report fairly brief. Hotel is in a great location just across from the beach...i believe the upper rooms can have great views. I had however requested a low floor room...which i got...as i'd heard the lifts here are quite slow!...This enabled me to use the stairs! Hotel is lovel and clean, and the Staff are as friendly and helpful as any you could hope to meet in Benidorm. I had a single room, which was ok...nothing special, had a double bed in and small balcony. Air Conditioning/Heating was a bit fiddly to operate, and the rooms are a bit dated, including the bathrooms. Water kept going a bit from Hot-Cold in the shower! Room cleaned well daily! The Food was really very good here, always plenty of choice and of good quality too. One thing i did like was that the atmosphere in the Dining room was calmer than in most hotel dining rooms which tend to be a bit hectic and rather noisey...this wasn't the case here, you were shown to a table by the Maitre D, and the place was really quite relaxed...this might be different with a full hotel in the height of summer, but others ive spoken too, have said its still pretty similar then!...Dont know if the start of an All Inclusive option will affect this or not! NIce little wine list and waiters come to your table to take drinks order...and you pay on way out! They have Theme nights here too...including a Chinese one when i was there!..Deserts very nice too! Didn't notice what the entertainment was like here as i go out in the evenings. The pool seemed a decent size but being December wasn't something i was going to need! Probably gets very busy in Summer. All in all, a very good hotel, with excellent food, in a brilliant location...close enough to everything, but not noisey at night!...As mentioned the staff are first rate too. I'd stay there again anytime...if i can get it at a reasonable price! hotel definately not a 4 star. found food very good and plenty of variety. understand that hotel is getting a refurbish and going all inclusive.quite shabby and needs it. wouldnt go back as we dont like all inclusive but if you do, then after refurb worth considering as food very good. This was our third visit to this hotel and we were not disappointed. We had a top floor room with a view over all of Benidorm. We could sit on our balcony watching the planes taking off and landing in Alicante. The rooms were spacious and clean. The staff were the friendliest I've came across anywhere, especially Roberto and the restaurant staff who made us feel welcome. The food as usual was very good with plenty of variety. Compliments to the kitchen for the amazing Xmas buffet they laid on. Only problem we couldn't try everything ther was so many different dishes.